While there is a lot of news pouring in about the Moto E, Motorola seems to be planning another two variants of its extremely popular Moto G.
According to sources, Motorola is expected to release another two variants of the Moto G called the Moto G LTE and the Moto G Ferrari. The Moto G LTE is obviously the LTE-enabled version of Moto G. however the handset is said to be available in just the higher 16 GB version priced at around $260 but may also include a Motorola flip shell costing $29.99. As of the specs, we expect them to remain same as the regular device. 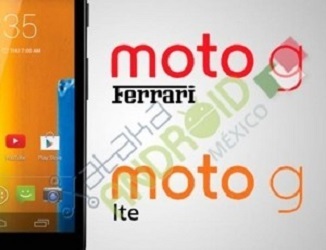 The Moto G Ferrari is still a mystery as there are no details available. However, given Motorola’s fascination with Ferrari, this could be branded smartphone in the red Ferrari colour with the sports car manufacturer’s logo on the front and back. Either ways, we don’t expect any specs upgrade. This is even more certain after Motorola released the Moto G Forte variant with just a Grip Shell on the regular Moto G.
Samsung Galaxy Note Pro 12.2 Review: How big is too big?